For ClusterControl, this marks the first time for supporting time-series data; strengthening our mission to provide complete life-cycle support for the best open source databases and expanding our ability to support applications like IoT, Fintech and smart technology. TimescaleDB can ingest large amounts of data and then measure how it changes over time. This ability is crucial to analyzing any data-intensive, time-series data. In addition, anyone who is familiar with SQL-based databases, such as PostgreSQL, would be able to utilize the TimeScaleDB technology. 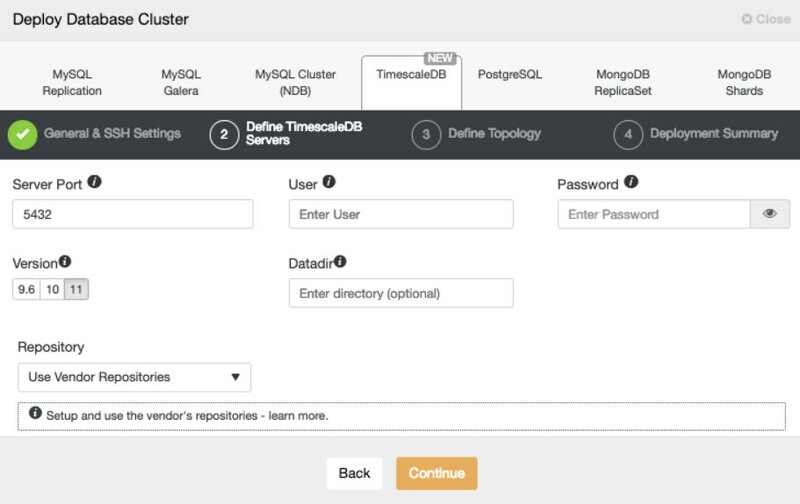 ClusterControl allows TimescaleDB users the ability to quickly and easily deploy high availability TimeScaleDB setups; point-and-click, using the ClusterControl GUI. Out of the box monitoring and performance management features provide deep insights into production database workload and query performance. 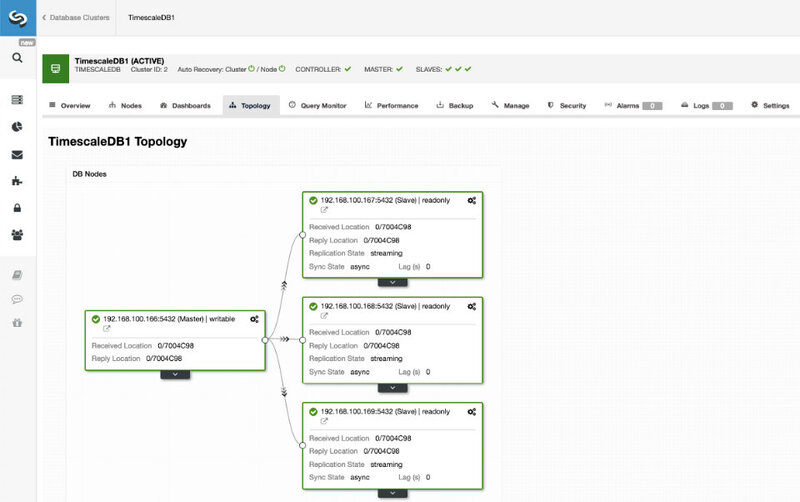 ClusterControl automates failover and recovery in replication setups, and makes use of HAProxy to provide a single endpoint for applications, ensuring maximum uptime. 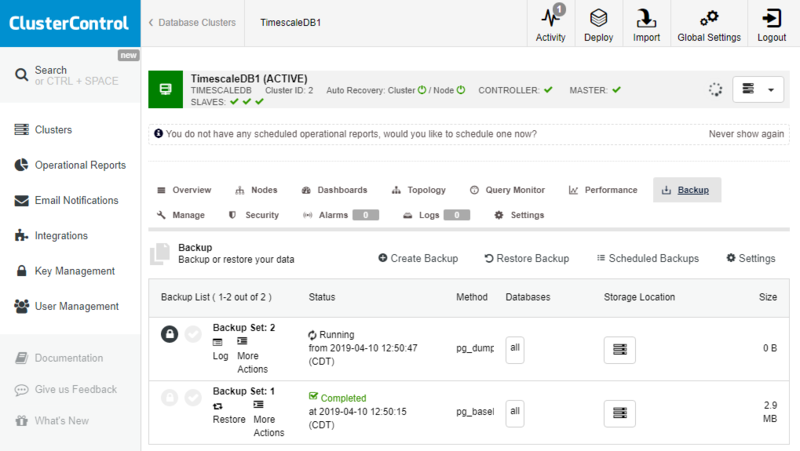 In addition, ClusterControl also provides a full-suite of backup management features for TimescaleDB including backup verification, data compression & encryption, Point-in-Time Recovery (PITR), retention management and cloud archiving. TimescaleDB is perfectly suited to applications who need to track a large amount of incoming data and examine how that data changes over time. Internet of Things (IoT) - While the array of products that fall in the IoT category are vast, TimescaleDB enables many scenarios to be successful. Timescale allows IoT companies to “go deep” in their analysis of the data hidden inside the usage of these devices, information that can be used to build new products and features. Systems Monitoring - high-traffic applications require time-series data to be able to analyze and understand usage patterns of their users. TimescaleDB provides the ability to do this at scale, handling and making sense of large amounts of data inputs. Business Analytics - Analyzing time-series data allows businesses to extract meaningful statistics and other characteristics. This data could include transaction data, trends, or pricing. FinTech - Time-series financial analysis allows users to better understand the marketplace and improves their ability to generate quality forecasts. Because TimescaleDB is built for volume and speed, FinTech companies can utilize it to “cast a wide net” and process data at an even faster rate than before. 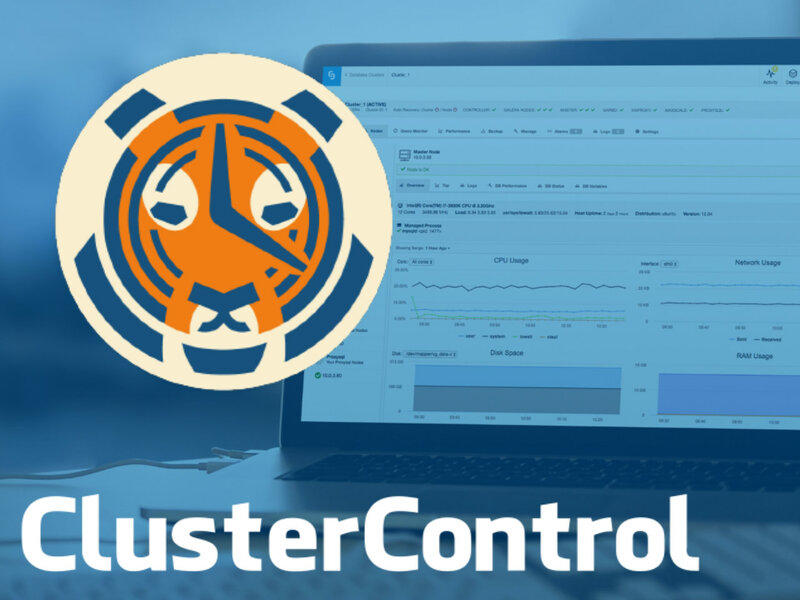 Timescale can be deployed and monitored for free using the ClusterControl Community Edition and all additional features can be tested in a 30-day trial of ClusterControl Enterprise which can be downloaded for free.